Brand New: Hawai’i Island ‘Ukulele Retreat! As always, we have chosen instructors with a proven track record for teaching, engaging their students, AND the ability to present material in a variety of musical genres. (And folks who are just, plain fun!) As we do at the West Coast ‘Ukulele Retreat, we plan to keep the student-to-instructor ratio right around 10 to 1. 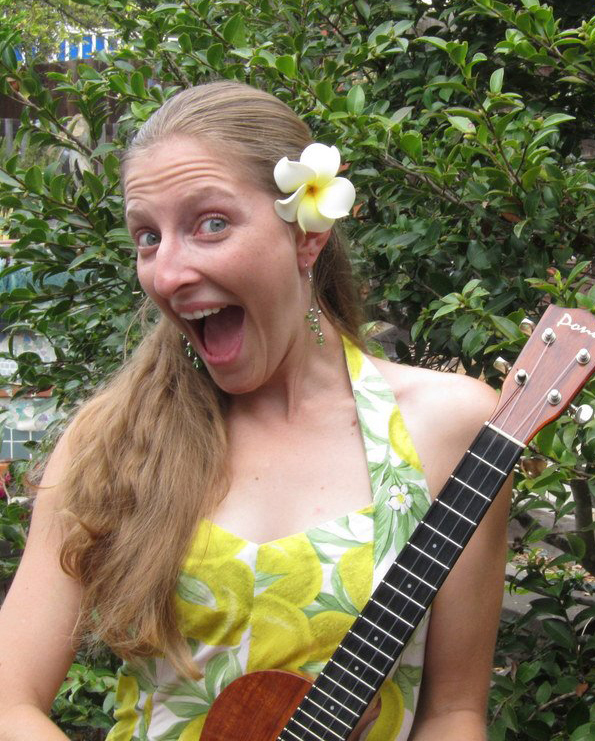 Here’s who will be there to instruct and inspire you: Sarah Maisel (you can see how excited she is to be making her Hawaiian debut), Peter d’Aquino, Bryan Tolentino, Andy Andrews, and Dave Egan. To offer guest workshops and local insights, we will also be drawing from the significant pool of local Hawai’i Island talent: Keoki Kahumoku, Alan Hale, Kona Bob, Chuck Moore, Ka’ulani Trainor, and more. Naturally, there will be more of an emphasis on Hawaiian music and culture than we have at Asilomar and Camp O, but please note that all other musical genres will be well-represented at the Hawai’i Island ‘Ukulele Retreat. There will be up to five workshop sessions each day and participatory events each evening. We will also be planning some special events and excursions to celebrate all that Hawai’i, and in particular Hawai’i Island, has to offer. Fees are dependent upon the housing option you choose. You can pitch a tent and pay only $1048 for everything including three fabulous meals a day and all your ‘ukulele instruction. 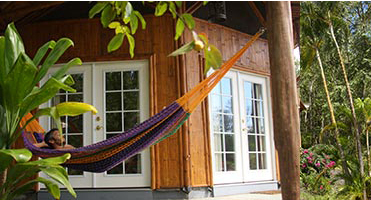 Or you can share a deluxe tropical cottage for $1,710. And there’s everything in between! But, you should register as soon as possible to get the housing option you prefer. You can print out the registration form by clicking on the link above. You will be registering for everything (the retreat AND accommodations) at the same time. Page one describes the facility, Kalani Honua, and the various housing options, which run the gamut from campsites to deluxe cabins. Page two is the actual form you need to fill out and return to us. There are a limited number of rooms in each category, so the sooner you can return the form and your deposit, the better chance you have of getting your first choice in accommodations. If you are coming alone but would like to share a room as a double (or triple), we’ll try to find a roommate for you. If you are a couple, both coming to participate, each of you should register as a double. If you are a couple, but one member is coming as a “companion,” then the participant should register as a double and their partner as a companion. If you want to extend your stay at Kalani (by arriving a few days earlier and/or leaving a few days later) and take advantage of the special group prices, you should include that information on the registration form. Please note that you can only take advantage of the group prices to extend your stay by staying in the same class of accommodations that you book for the retreat. Again, your chances of being able to accomplish this are greater the sooner you register. The retreat center is closer to Hilo than it is to Kailua-Kona, but you might find it easier (and less expensive) to get a flight into Kailua-Kona. We will try to help everyone get from either airport to Kalani Honua by organizing carpools or hiring vans……there may be an extra charge for this. If you should choose to fly in on Hawaiian Airlines (my personal favorite) I am asking that you please use our affiliate link when booking your flight. By using this link you will 1) receive an automatic 5% discount off the lowest published online fare 2) be able to acquire miles in your own frequent flier program and 3) add an equal number of miles to the ‘Ukulele Festival’s frequent flier program which helps us with travel expenses when we bring instructors to and from Hawai’i. It costs you nothing extra to go this route and benefits all of us! Win-win! Why is Hawaiian Airlines our airline of choice when flying to Hawaii’i? Convenience AND the Hawaiian experience that begins the minute you board the plane. That’s it for now. Let us know if you have any questions! ~ by UkuleleLady on March 26, 2013.